Dhoni is celebrating his 37th birthday. India cricket captain Virat Kohli wished his former captain with an emotional message. Check out photos and videos here. World Cup-winning former India captain MS Dhoni celebrated his 37th birthday on Saturday, July 7 along with his family and teammates at the team hotel in Cardiff. Dhoni, who is part of the Indian team for the ongoing tour of the UK, was joined by wife Sakshi, daughter Ziva and members from the T20I team as he cut his birthday cake. The likes of Pandya brothers and Deepak Chahar cheered and sung birthday song before the veteran stumper was smeared with the birthday cakes. Wishes have been pouring in for the man from Ranchi who had played his 500th international match — second T20I against England in Cardiff — on the eve of his birthday. With 90 Tests, 318 ODIs and 92 T20Is, Dhoni has become the third Indian after Sachin Tendulkar and Rahul Dravid and only the ninth overall to achieve the milestone. Skipper Virat Kohli, in a video uploaded on BCCI website, wished Dhoni and said he feels honoured to continue playing with his former captain. "You at that age as fast as ever. It's great to see you happy, see you smiling and enjoying yourself. I wish you all the best. God bless you. It's an honour for me to be playing with you still. I started under you and you know the respect we share. My best wishes to you and all the positive energy towards you," Kohli said. As expected, former India opener Virender Sehwag led the birthday wishes for Dhoni on Twitter. Sharing a photo of the Indian captain being at full stretch in front of the crease, the batting great wrote: "May your life be longer than this stretch and may you find happiness in everything, faster than your stumpings. Om Finishaya Namaha! (sic)." The rest of the cricket fraternity joined in as "#HappyBirthdayMSDhoni" started trending on Twitter. 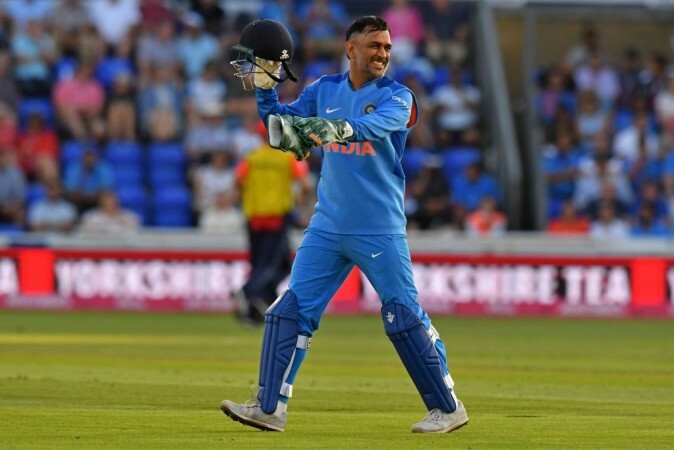 Dhoni and his teammates suffered a defeat on the eve of his birthday as England comfortably won the second T20I and levelled the three-match series at Sophia Gardens. Dhoni's late cameo 24-ball 32 was not enough as England, led by Alex Hales' half-century, gunned down a 149-run total with two balls to spare. The wicketkeeper-batsman, regarded as one of the best to have ever played the sport, has headed to the UK tour on the back of a successful Indian Premier League campaign with CSK. Apart from leading the team to glory, Dhoni proved his critics wrong by turning back the clock and scoring 455 runs ni 16 matches at 75.83 and strike rate of 150.66.